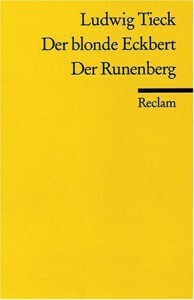 I've read Der blonde Eckbert twice actually, but I'd never read Der Runenberg ... until yesterday ;). Regarding the first of these two, this is a tale that will first make you go "huh?" and then, when you read it a second time, you start noticing all these little details and clues which point towards how the story's going to end. (I think this is probably true for Der Runenberg as well, but I haven't studied this one in as much detail). That being said, however, the ending still leaves one with lots of questions about guilt and the morality of the tale, because it's not as straightforward as the narrator would like the reader to think. For instance (and here comes a spoiler!) can Eckbert really be blamed for marrying his sister since he had no clue about her identity? Does he really deserve to descend into madness like that? These two tales are definitely interesting reads, in particular when you try to get to the bottom of them. The only problem I have with them (hence the three star rating) is that I didn't find them quite as gripping as I feel they should have been. I don't know, I was interested to find out how the stories would end, but at the same time I felt bored by some of the narrative (as, for example, all the descriptions of the landscape). And since I rate stories according to the enjoyment I had reading them, it had to be three stars.